Stars: Regina Hall, Issa Rae, Marsai Martin, Justin Hartley, Rachel Dratch, Mikey Day, Thalia Tran, J D McCrary, Tucker Meek, Luke James, Tone Bell, Marley Taylor, Eva Carlton, Marc Hawes, Caleb Emery. This laboured and painfully unfunny comedy is an African-American centric variation on the body swap formula that drove films such as the superior Big, Freaky Friday, 17 Again and Suddenly 30, and tramples it into the dust. There is little about this dud to recommend it to audiences. A nerd when at school, twenty-five years later Jordan Sanders (Regina Hall, from Girls Trip, The Hate U Give, etc) is a high-powered millionairess and ruthless, work obsessed executive of a technology company that develops apps for clients. Her picture graces the cover of magazines. She enjoys the trappings that wealth has provided. She is also incredibly demanding, domineering, overbearing and demeaning and cruel to her staff. But now she is under pressure to develop an innovative new app for an obnoxious major client (Mikey Day) or else he will take his business elsewhere. Her mean-spirited acts are witnessed by Stevie (Marley Taylor), a young girl and aspiring magician who waves her magic wand and wishes that Jordan could experience what it feels like to be picked on. 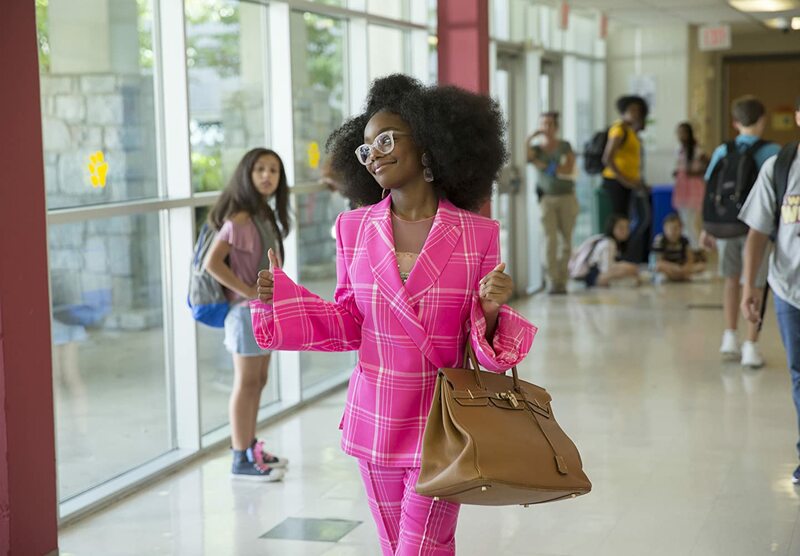 Due to this unlikely act of magic, Jordan is transformed back into her former precocious 13-year old self (now played by relative newcomer Marsai Martin, from tv series Black-ish) with a big afro hairdo and nerdy Coke-bottle glasses. In Big we accepted the magical transformation and wish fulfillment angle because of the inherent likeability and charm of Tom Hanks, but here the character of Jordan is so shrill and unlikely that we don’t buy it for an instant. Anyway, before long it’s back to middle school for Jordan, and she discovers that it is just as unpleasant an experience now as it was for her back then. She has to deal with the clique of mean girls, and she also befriends a trio of misfits – Riana (Thalia Tran), Isaac (JD McCrary), and Devon (Tucker Meek) – who themselves find it hard to fit in. And she also comes to an understanding of her harried, stressed out, overworked and underappreciated personal assistant April (Issa Rae, from tv series Insecure, etc). So far so formulaic and predictable. But Little becomes a bloated mess with a run time just shy of two hours. The script has been written by Tracy Oliver (Girls Trip, etc) and director Tina Gordon (who also wrote the recent misfire What Men Want, etc). Gordon’s direction is pedestrian and sluggish, and the film is tonally uneven, with many moments that fall flat. There are some cringeworthy overly sexualised scenes that are clearly unsuitable for the target audience of teenaged girls. However, there is one highlight and that is the marvellous performance of the pint-sized 14-year old Martin, who is also credited as one of the producers and creator of the film. She apparently had the idea for this role swap comedy when she was 10-years old and managed to pitch it to a major studio. Martin brings plenty of sassy attitude and maturity to her scene stealing performance that suggests she will go far if she can find good roles in the future. Rae is also excellent as the beleaguered April who bears the brunt of Jordan’s putdowns, and her comic timing and delivery of one-liners are spot on. She develops a wonderful but prickly chemistry with Martin. Overall there is little to laugh at in this lazy reworking of the classic body transformation comedy. Only the energetic performance of Martin and the comic timing of Rae save Little from being a complete disaster.